School is out, backyards are bustling, and households across the country are once again enjoying the long-standing summer tradition of grilling in the great outdoors. I can smell the aromas now. And with 3-in-4 Americans owning an outdoor grill and/or smoker, the backyard barbecue stands for much more than pleasant evenings with family and friends—grilling represents a considerable source of economic activity and a major boon to many a retailer and brand. Tuesday evening, Field Agent surveyed 1,194 U.S. adults* across all 50 states to understand the outdoor-grilling behaviors, purchases, and brand preferences of American households—call it the business of backyard barbecues. All respondents were required to submit a photo of their outdoor grill, so we could be certain we were surveying authentic grilling households. *All respondents were U.S. adults and smartphone owners. Respondents were asked to complete the survey on behalf of their households. The survey was completed entirely through the Field Agent mobile app. Households from all 50 states were represented in the survey. Respondent ethnicity – Caucasian or any combo with Caucasian: 80%; African-American or any combo with African-American: 9%; Hispanic or any combo with Hispanic: 6%; Other: 7%. Household incomes - <$35K: 21%; $35-49K: 22%; $50-75K: 26%; $100-149K: 12%; $150K+: 6%. 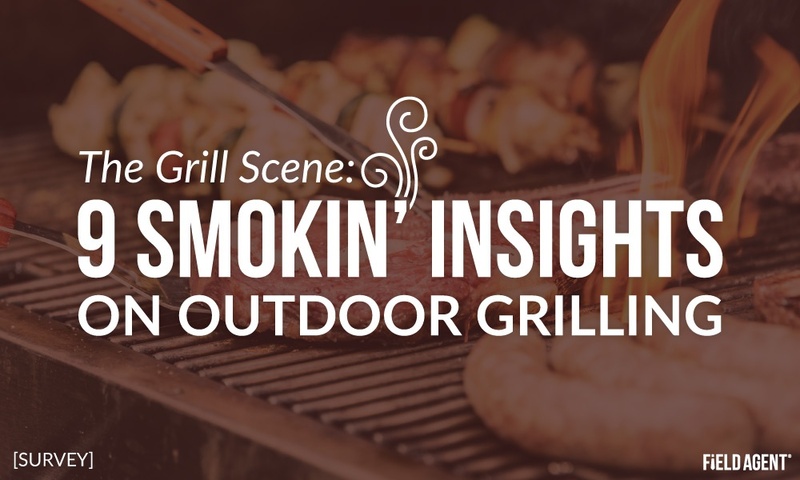 Below we offer 9 smokin’ insights into the outdoor-grilling behaviors, purchases, and brand preferences of 1,194 U.S. households. But first, take a glance at this video compilation featuring grill-owners discussing their summertime, backyard barbecue purchases. Get this: 71% of households in our survey (all of which own an outdoor grill) indicated they grill-out a minimum of once a week during the summer, broken down as follows: 35% at least once a week, 27% at least once every three days, and 9% practically every day. And in case you’re wondering, much of this grilling is done on gas grills, particularly propane. 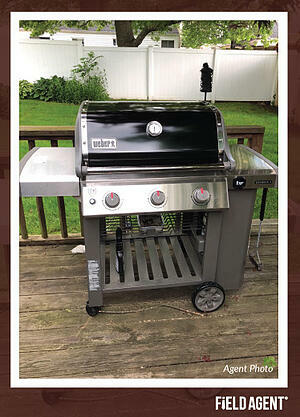 In our survey, 61% said they own and use a propane-based grill, compared to 40% with a charcoal grill. Not surprisingly, at 53%, friends and relatives are a major—and trusted—source for such information. 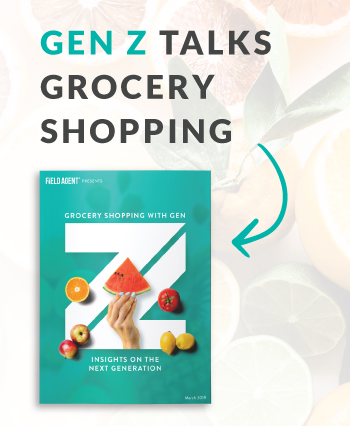 But good enough for second place, in-store displays and kiosks garnered an impressive 49%—higher even than online customer reviews (41%), product packaging (32%), brand websites (26%), and social media (25%). Companies might want to check on those in-store displays, prices, and products this summer. Among the 1,194 households in our survey, some 75% indicated they purchase non-consumable grilling supplies—grills, grill accessories, charcoal, utensils, lighter fluid, etc.—from Walmart. The home improvement channel is also a popular destination for grilling supplies. Thirty-nine percent of households said they make such purchases from Home Depot and 37% from Lowe’s. At 25% and 16%, respectively, Target and Amazon rounded out the top five. And it ain’t even close. Of the 478 households in our survey who use a charcoal-based grill, a sizzling 88% reported purchasing Kingsford brand charcoal. Second place? A full 72 percentage points behind Kingsford: Royal Oak at 16%. Cowboy brand gleaned 3%. 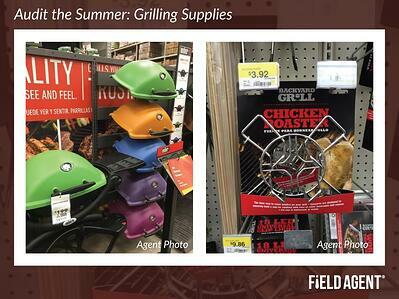 Field Agent also asked respondents what foods their households grill during the summer months. These are foods, we stipulated, that are actually grilled. Top five meat courses: hamburger (95%), chicken (91%), steak (89%), hot dogs (88%), and pork (62%). Top five non-meat courses: corn (70%), pepper (52%), onion (52%), asparagus (40%), and zucchini (39%). Among brand-conscious, bun-buying households (n = 633), 40% purchase Walmart’s Great Value brand, followed by Ball Park (33%), Sara Lee (25%), King’s Hawaiian (24%), and Pepperidge Farm (19%). Field Agent asked all 1,194 households how often they serve three kinds of chips—potato, tortilla, and cheesy—with grilled foods during the summer. For many, it's simply not a cookout without the bagged chips. Eighty-one percent of households reported serving soda/cola with their grilled foods during the summer. Rounding out the top five cookout beverages: bottled water (73%; water from the tap: 37%), beer (63%), cold tea (59%), and lemonade (55%). Grilling, it seems, can be a spirited affair. 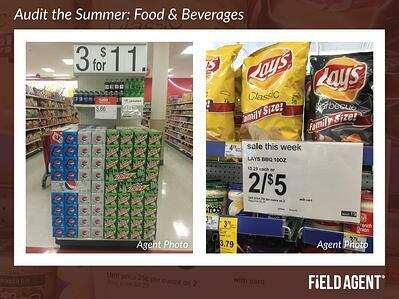 Field Agent also presented several non-consumable items sometimes associated with outdoor grilling, asking respondents which they use during their at-home, summertime cookouts. Among the top choices were utensils (tongs: 92%; spatula: 80%), furniture (patio/outside furniture: 64%; lawn chairs: 56%), skewers (59%), stereo/sound systems (49%), and insulated coolers (45%).